​Rental Uniform Pack, t-shirt, briefs, cheer socks, cheer bow, backpack, cheer shoes, water bottle, Rental Pom Poms and trophy. ​Each Cheerleader will fundraise towards the cost of Cheer. We are NOW REGISTERING for 2018 Summer/ Fall Cheer in Edmonds. This Season Cheerleaders will cheer for local youth Tackle Football teams. 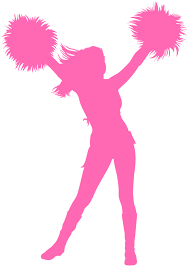 Cheerleaders will tryout to be placed on one of the 3 cheer teams with Pink Zebra Cheer. No tryouts necessary for Diamonds. ​This fee will go towards registration or Returners fee after tryouts. Tryout Fee must be paid on or before 1st day of tryouts. No Refunds on Cancelations. ​All Varsity Cheerleaders will be invited to attend a 3 day Cheerleading camp. Varsity Cheerleaders will learn up to 45 cheers and 2 halftime dances. Camp Package includes: Camp t-shirt, Bow and Shorts. Cheerleaders will fundraise towards the cost of camp package. ​Rental Uniform Pack, t-shirt, cheer bow, Rental Pom Poms and trophy. Other items purchased separately if needed.